There are many legends that stem from this part of the United States. The presence of impenetrable swamps is a dominant factor in numerous sightings of ‘Florida swamp monsters’ such as the larger than life Big Foot. The latter must undoubtedly be quite a source of inspiration to the protagonist of this story. Just visit the website of Cohn Racers (http://www.cohnracers.com/ ) and you will see all their bikes clad in big rubber! 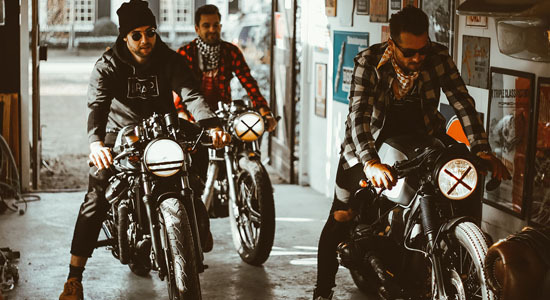 Many of the builders around the world have inherited the passion for riding bikes from their fathers. Juan P-Ilzarbe (JP) is no exception. 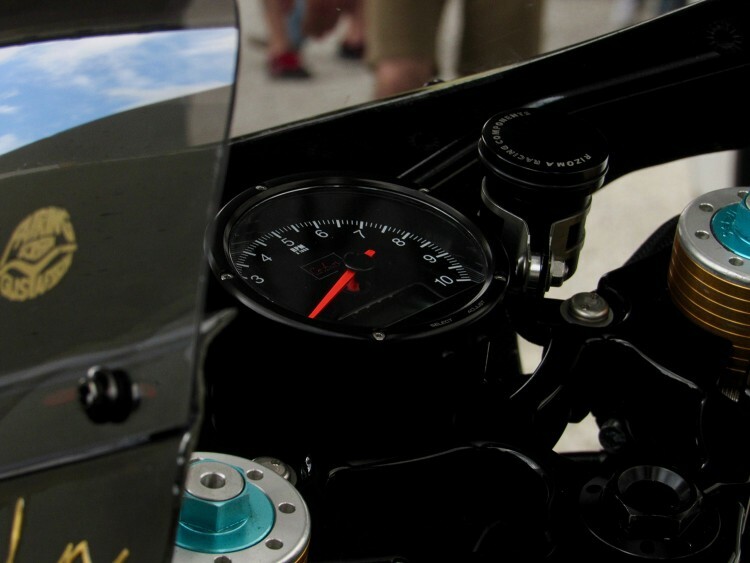 His father (John Welham) is described by his son as “an incredibly craftsman and motorcycle rider”. Barely two years old JP was introduced to the joy of riding. This resulted in the boy participating in races around Europe as a member of a Q8 sponsored team. An injury forced him into early retirement from racing at the age of 16. From there on JP decided to pursue a technical education. Clearly not only inspired by technology based on two wheels, our builder worked for Apple in California on special projects, while building bikes for himself and friends. Rather than following this path of success in the IT world, he came to the conclusion life would be better building bikes as an entrepreneur. 2017 was the birth year of his own company ‘Cohn Racers’, located in Coral Gables Florida. 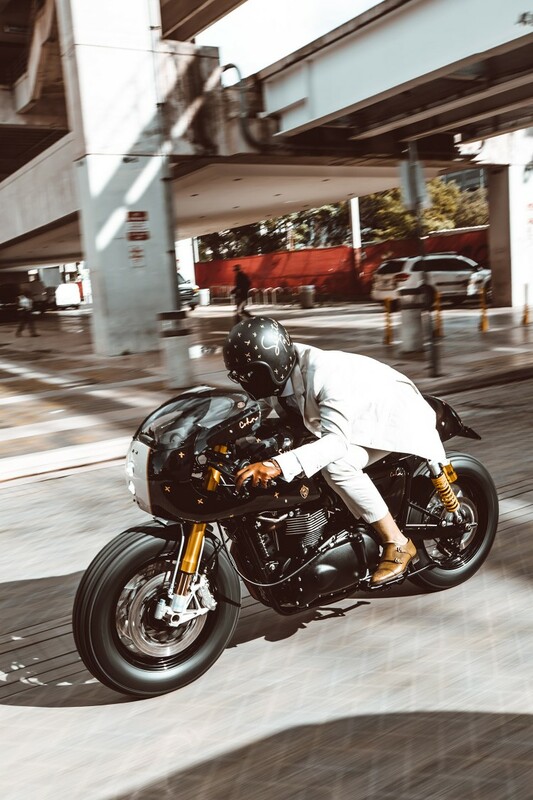 For the past year, JP and a childhood friend have dedicated themselves to designing and building outstanding bikes based on Harley Davidson, Ducati, and Triumph. Even more of an inspiration than Big Foot to JP and his pal is the lure of the Ilse of Man. At 620,9 meters above sea level, Snaefell mountain is the highest peak on the island, home to the legendary Tourist Trophy held every year since 1911. 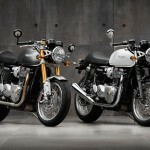 It is only fitting that the series of bikes the guys had in mind are based on an equally iconic British brand. 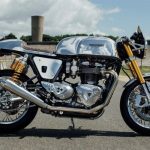 The #2 build from this anticipated series of 10 bikes is (just like the rest of them) a Triumph. 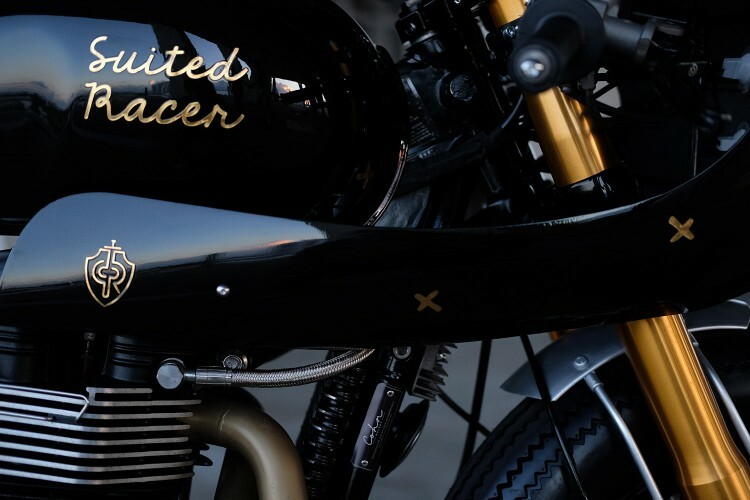 This project was commissioned by an artist known as the ‘Suited Racer’. 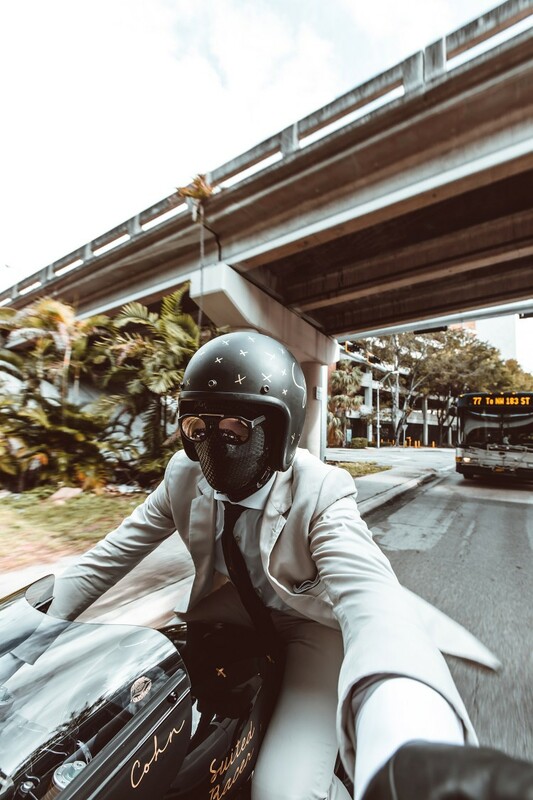 His appearance will undoubtedly be familiar to many bike fans, as pictures of him riding bikes with full face mask and sunglasses appear regularly all of the internet (@thesuitedracer). 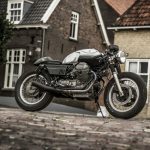 According to JP Triumphs are great bikes to use for their projects. They are readily available and have that very distinctive and retro look already. 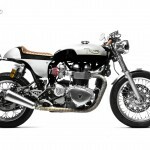 This 2012 Thruxton was a very clean and hardly used bike. An ideal platform to serve as a canvas for this NY based masked client. 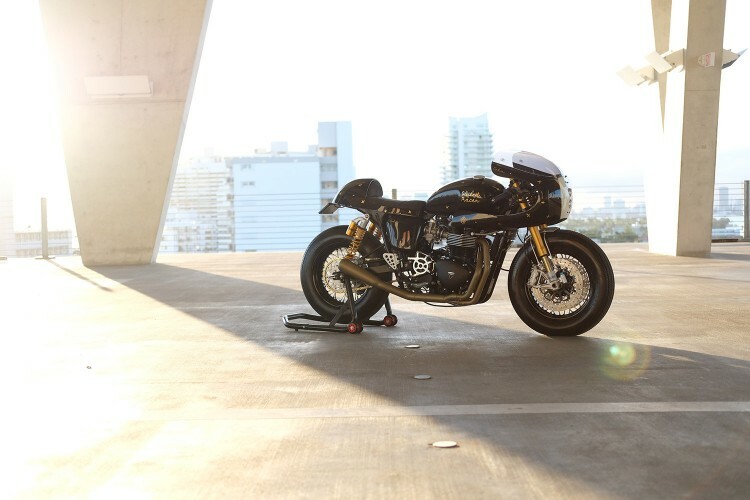 The Triumph was stripped to the bone and built up from there. 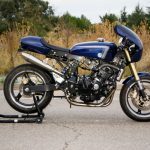 The factory subframe was cut off and replaced by a custom-made version by Cohn Racers. To create a real retro look, a special seat pan was produced fitting a smoothly curved tail section. The rear part is fitted with four screws and can easily be removed should the rider feel lonely and decide to add a passenger for company. Both the rear section as well as the front fender are fruits of Cohn Racers labor. Over 30 hours of work go into shaping a sheet of metal into these beautifully crafted pieces of art. And we’re just talking about the rear seat. But it is not just the looks what make turn Sneafell into a classic. Both front and rear are fitted with top of the line Öhlins suspension. The upside-down fork not only looks the part but does magic to road handling and agility. 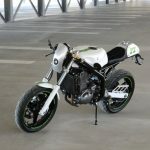 The result is a motorcycle with a stiffer chassis, Öhlins inverted forks and rear shocks resulting in a lowered center of gravity, and optimized geometry, for getting through apexes quickly while remaining incredibly stable. To ensure the maximum stopping power Cohn use twin front Brembo four-piston front calipers with large 320mm rotors. The original front (18”) and rear (17”) wheels were replaced with 16 x 3.5” versions and fitted with vintage Firestone tires. The bike looks amazing and muscular on those big feet. BikeBrewers have not (yet) tested the bike, but according to JP the handling is superb. Engine modifications were kept to a minimum to ensure reliability. Some tuning is done on the DME (Digital Motor Electronics) for a better engine response, but that’s about it. Remapping was required anyway after mounting a customized exhaust covered an Cohn’s “secret recipe” coating. We at Bikebrewers love the way Snaefell #2 came out altogether. 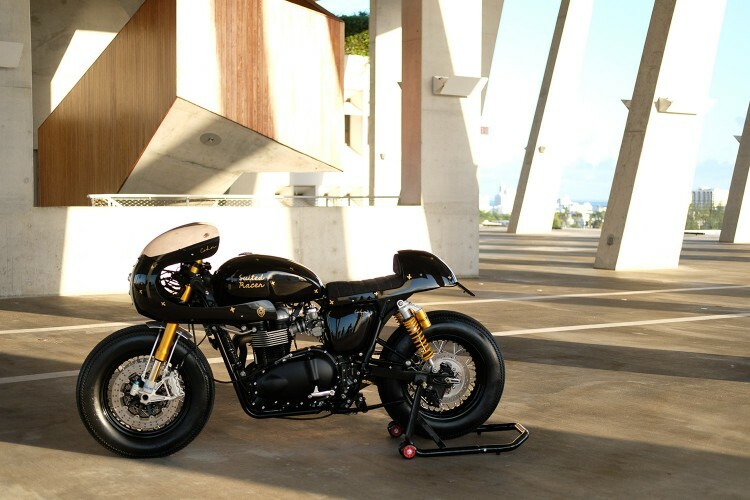 It’s a beautifully crafted bike, with a tasteful design. Trademark finishing touches on the paintjob done by the NY owner himself. Believe it or not, the black base is anointed with gold leaf illustrations. 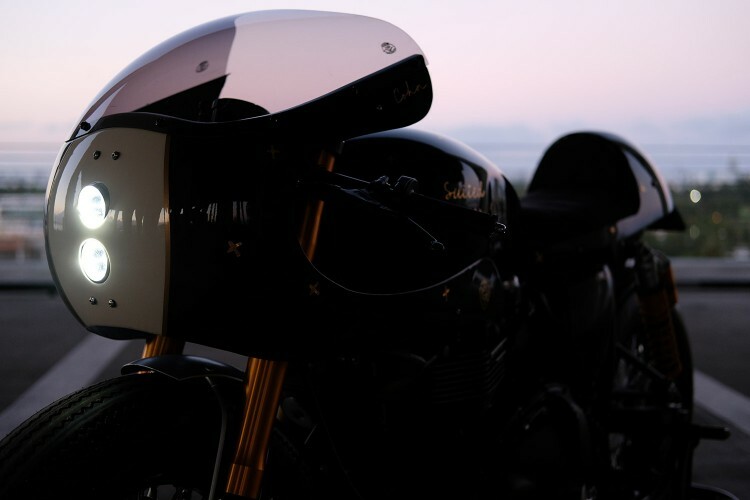 The racing-inspired half fairing, the wheels and tail section take this motorcycle to another era. At the same time keeping modern technology present in every piece. Perfectly executed. 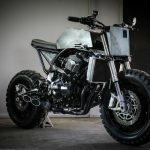 JP and his friend have been working on their footprint in the bike market for just over a year now. They have every right to be confident they are now ready to “make a statement on the market”. They only want to go for the best results. 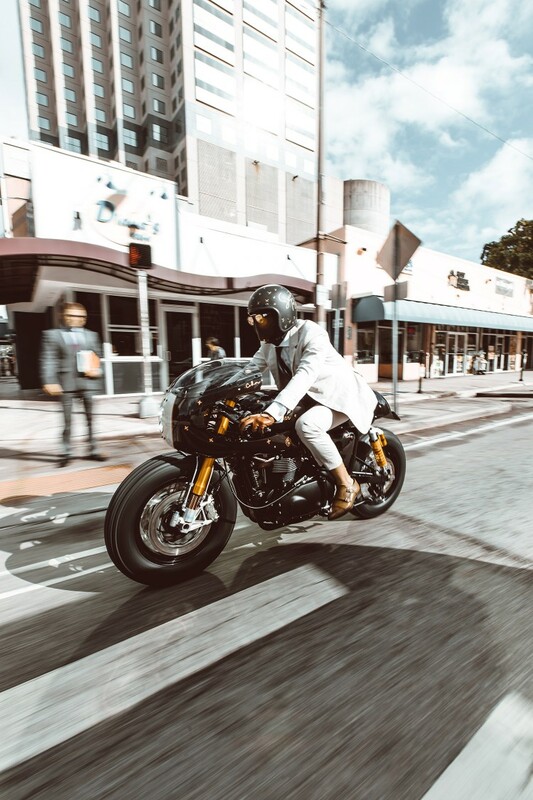 If you are looking for an exceptional looking bike, Florida is the place to go to. But make sure you have money in your pocket. Prices of a ‘Snaefell’ start at just over $ 39K. JP: “We really don’t put budgets on our builds as that tends to demoralize us and interfere with our creativity.” While on the subject of money, Cohn Racers would welcome investors to help them create their dreams. 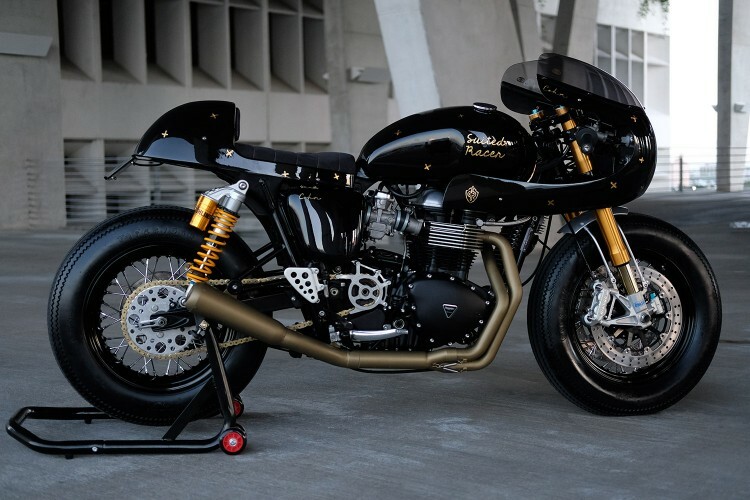 Just some eye-candy, but I needed to share this shiny Triumph Thruxton R with you. It's built by AMR Vittel for Triumph France. 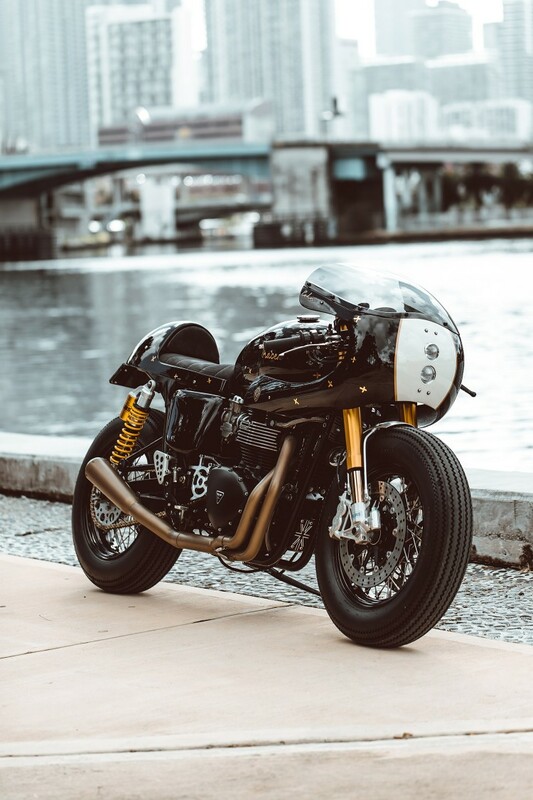 Great bike, great build. But what the heck is he wearing on his face?